The Cast and Crew for Gina K Designs welcomes you to another fabulous blog hop celebrating the new April Release stamp sets by Gina K and the illustrator team from Gina K Designs! We hope to inspire you with some beautiful card projects as you hop along to each of the designer’s blogs! 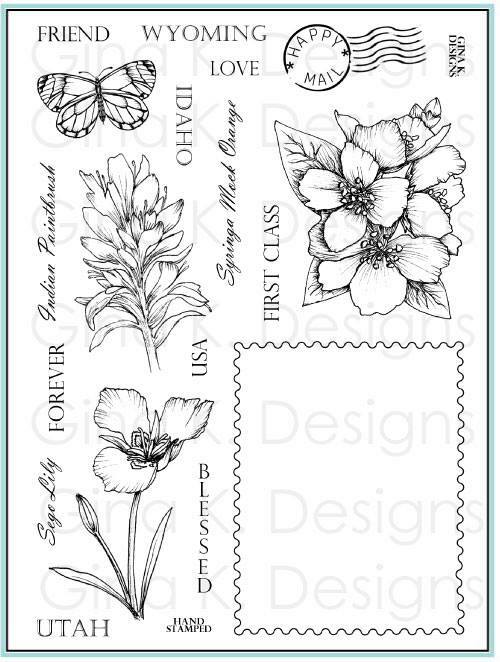 Today, we are featuring the stamp sets by Melanie Muenchinger and Theresa Momber. Today I am sharing the 5x7" card and envelope that I created for the StampTV release party using Melanie's new set Stately Flowers 11. 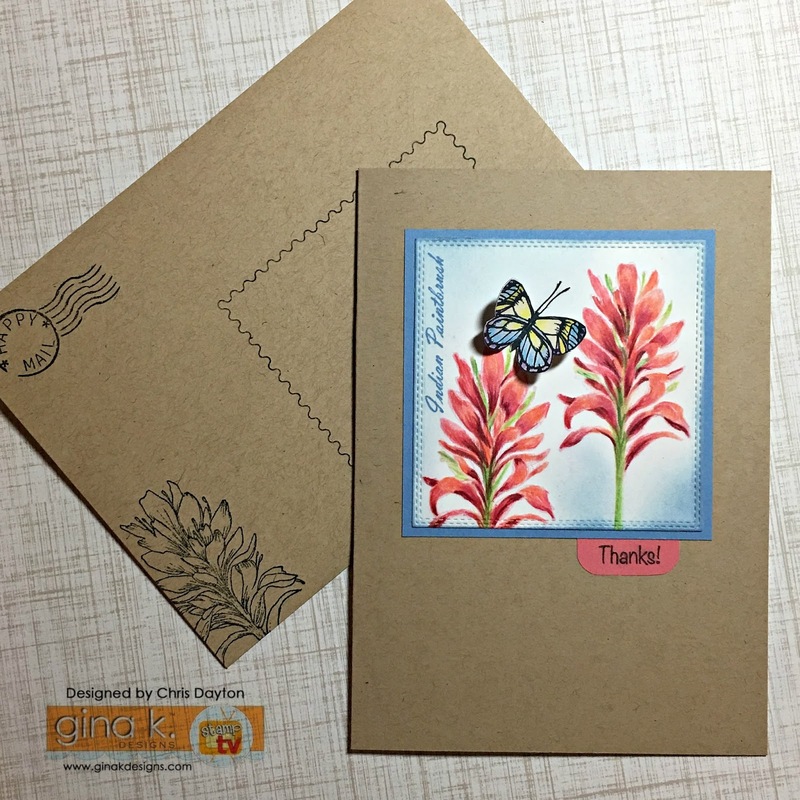 I used the Indian Paintbrush image and the butterfly image today for my card. 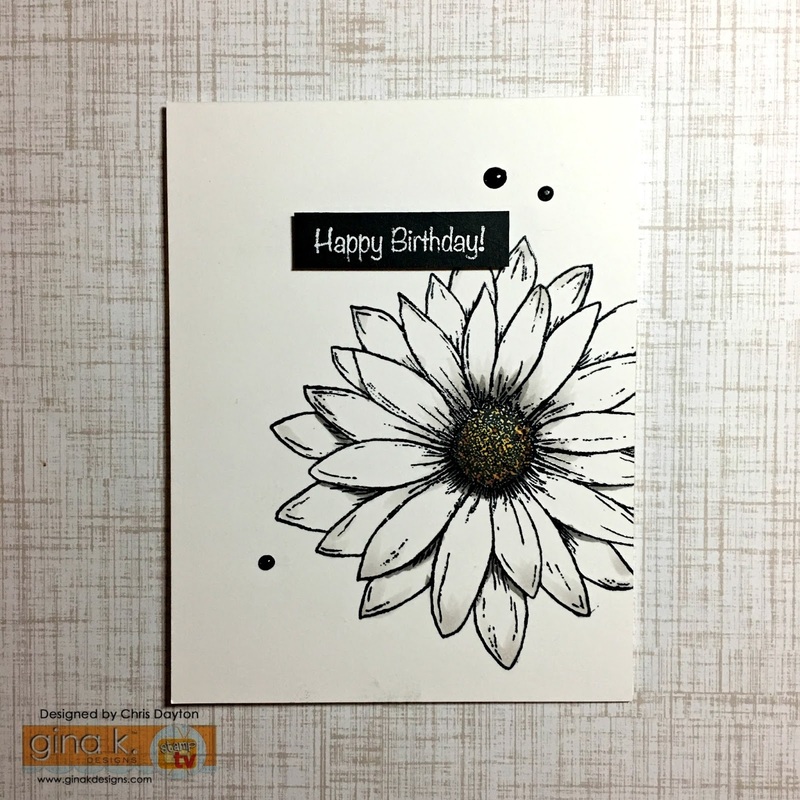 I stamped the flower onto GKD Artist's Choice cardstock using Innocent Pink ink. I colored the image with Prismacolor pencils and sponged a bit of Powder Blue ink very lightly to soften the starkness of the white background. Since the butterfly is a symmetrical image, I stamped it twice with Black Onyx ink, and colored them both the same. I fussy cut both, trimming off the antennae. I used a small piece of single strand embroidery floss to replace the antennae, sandwiching it in between the two layers. I then folded carefully along the butterfly body and adhered it to my card so that the wings appear in flight. 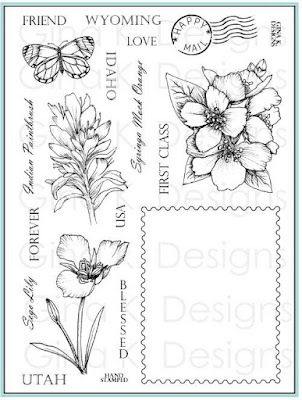 I stamped a few of the fun postage images, as well as the Paintbrush floral on my envelope to continue my theme. On this card, I used the postage images along with the Syringa Mock Orange image. I used my Prismacolor pencils on this one. 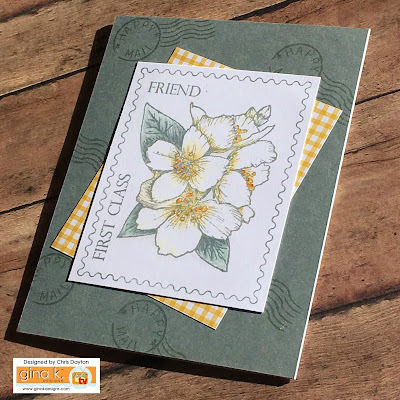 It is assembled with a Moonlit Fog cardstock panel stamped in matching ink and a piece of the pretty yellow gingham pattern paper from the Suhshiny Day paper pack. This card uses the Sego Lily image. I stamped on black card stock using white pigment ink, and colored with my Prismacolor pencils. Aren't these new Stately Flowers fun?? 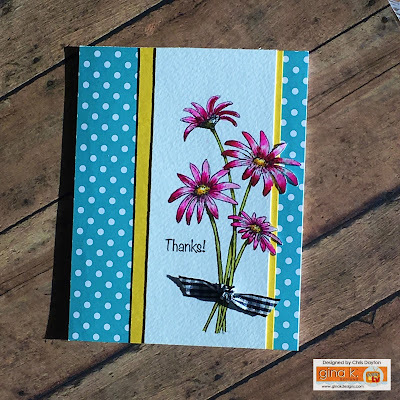 You may have seen this simple card using Theresa's Daisy Delight at the Release Party last Thursday. 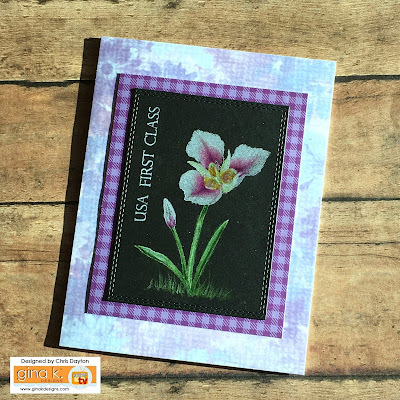 I used my MISTI stamping tool to stamp the flower in Mememto Onyx Black directly on my single layer card base. I left the stamp on my MISTI so that i could over stamp and heat emboss after I added a bit of Copic marker. I used warm gray Copics to give a bit of depth to the flower petals, and Y11, 26 and 28 to color the flower center. I placed my card base back into my MISTI and stamped again using Versamark ink, and heat embossed with clear embossing powder. My sentiment was stamped on a small black rectangle piece and heat embossed with White embossing powder. I used pop dots to attach the sentiment. Lastly, I added just a few dots of Black Nuvo drops to create a bit of a visual triangle. 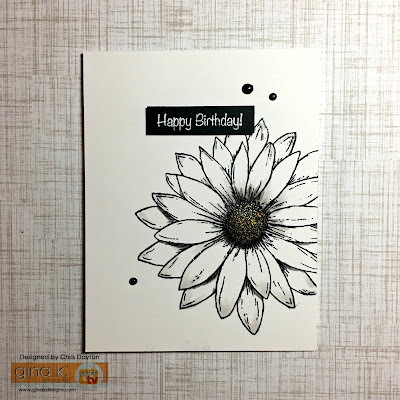 This card is uses the daisy bouquet image. I stamped using Versafine ink and watercolor paper, and used my Zig watercolor markers to color this image. I trimmed my panel down carefully using my slide trimmer, taking care not to cut through any of the petals. I hand trimmed the remaining petals and let my image pop over the edge of my contrasting layers. Ready for more inspiring creations from the rest of the team?! Just click on the links below for more from Gina and the Cast & Crew. Do you notice a new name in the list?? Please join us in welcoming Juliana Michaels to the Cast & Crew for Gina K Designs. Juliana has been a project designer in the paper craft/scrapbook industry since 2007 and has worked for many top manufacturers in the craft world. Her projects have been published in a variety of magazines and idea books. You will instantly fall in love with her projects! OMG! Beautiful cards. Love the design and the colors. All of these are so awesome Chris! I really love that 2nd one..with the yellow gingham piece behind the image. Your color choices are outstanding! So happy to hop! These are truly amazing! They are so real looking. Your so creative! Your color combos, just wow. As I scrolled through, I thougt I was going to comment on a specific one I liked. That didn't happen! Every card I came to I was like, "Oh I really like this one." Awesome cards! Loved them all! Chris, your cards are always so stunning! Love everything!!! Beautiful cards! Love the coloring with the Prismacolors. The flowers are gorgeous! Terrific cards and ART! your coloring and design are just amazing. Chris, I always enjoy your beautiful cards! Little pieces of art. Thank you for sharing your inspiration. Lovely cards. I really like the one with the black & white daisy. Love them all. But, that first card is my favorite. Thanks for participating and inspiring us. Beautiful cards, thanks for the inspiration! Chris, love your style! These cards are all awesome. Thanks for sharing! Oh Chris, your paintbrush takes me back to summers in the Wyoming Mountains. You have gotten the colors perfect. Love your clean and simple creations! 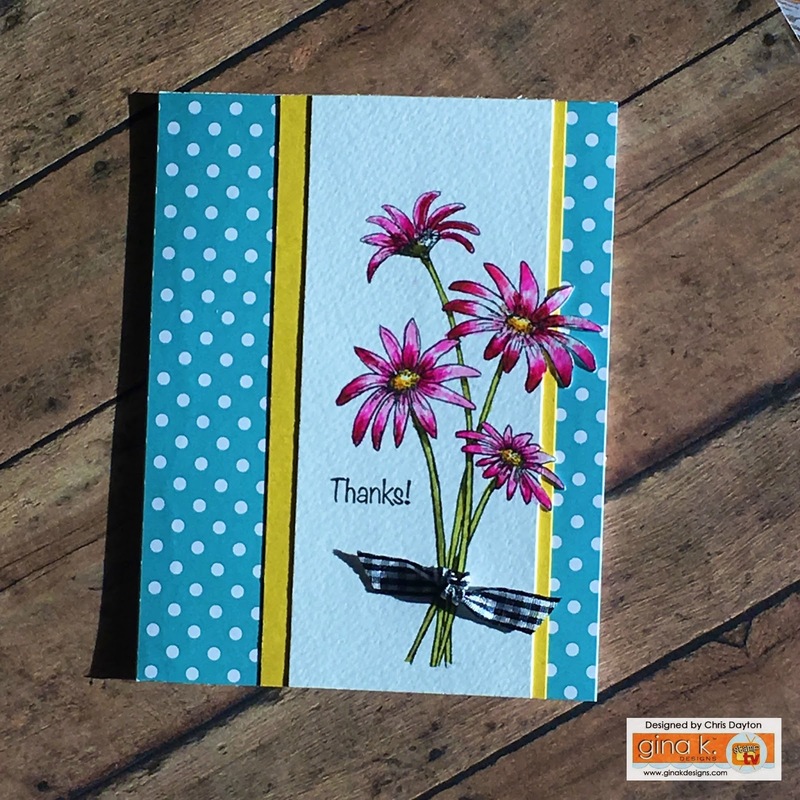 I love the kraft card with the pink tab sentiment! Such beautiful cards! I especially like the one with the flower extending off of the central layer...great idea! Wonderful job on your cards. Such beautiful cards! I really love the one with the Indian Paintbrush because it reminds me of the red ginger flowers in Hawaii. Awesome cards as always. Love the one done on back. Thanks for the wonderful inspiration. What a variety of cards. My favorite is the black with grey highlights. Simple, but effective - eye catching! What a fun series! Love all the uses of the Postage Stamp stamps! I did not know you could emboss post Copic. Learned yet another thing today! Thanks for sharing. Thank you for your creative cards! Your cards are so beautiful and I cannot believe the beautiful colors you got out of those colored pencils. Just fabulous work! All of your cards are stunning! Oh my, your flowers look like they are alive! Amazing! Truly love your cards. Each one is special using different techniques. Great examples of ways to use the sets. I am in awe...you create so many wonderful beautiful amazing cards! Beautiful cards and fabulous coloring as always! Beautiful. Love the contrast with the craft card stock. Your cards are totally amazing. I really liked the two contrasting cards, the one on kraft paper and the grey and yellow card. Always need inspiration when attempting to use either card stock. Thanks for sharing! WOW! An awesome array of beauty! Really smart designs! Love how you did that envelope too! PRETTY! Really gorgeous cards. All I can say Wow.... Thanks for sharing. Hi Chris! What beautiful samples! Love the colors you combined, the soft colors yet deep bold centers, the white pigment ink colored over with pencils - they're all stunners! 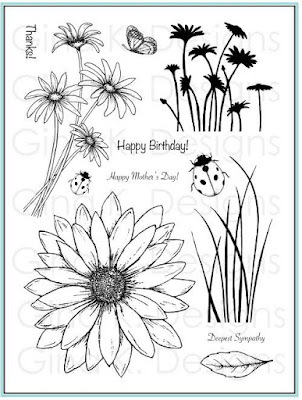 And there is the 3D daisy card I saw before. Outstanding! GORGEOUS cards, so much inspiration. Well done!!! I love your style!!!! Chris, your cards are beautiful. Thank you so much for the inspiration. Gorgeous cards. Flowers sure do make me feel happy. Beautiful! I love the stately cards, in particular. All of your cards are stunning! I only wish I could color as well as you do. These are great designs. Beautiful! I think your card super. You have really outdone yourself! These stamps are great, but your coloring is outstanding! Beautiful designs and gorgeous coloring! Awesome cards - the coloring on the flowers is just so realistic!!! What beautiful examples. 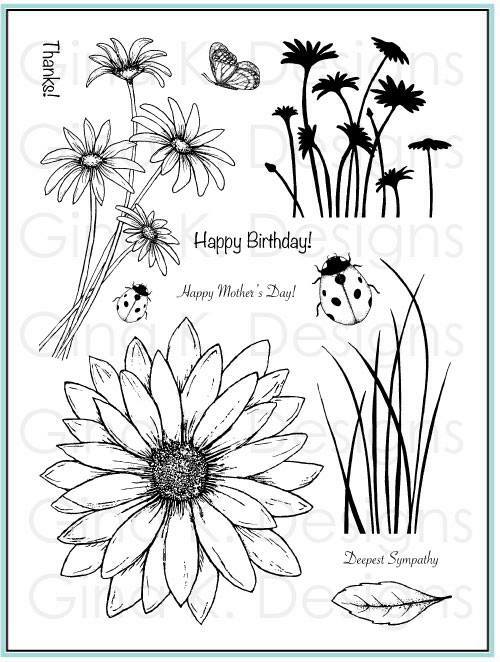 I have to say the black and white, with shades of grey for the daisy card is quite beautiful. Your cards are fabulous. I especially like how the red flowers with blue mat pop with the kraft! Beautiful cards. Love the overhang with the daisies. Just beautiful! Beautiful cards, Chris! Love your fabulous coloring! Oh what a gorgeous set of cards you created, Chris. Love each on of these! I liked each one as I scrolled through but then the last one really caught my eye. A wonderful job on each of them. Your cards are Oh, so lovely!